Preheat oven to 350 degrees. Generously grease and flour a 10-inch Bundt cake pan. 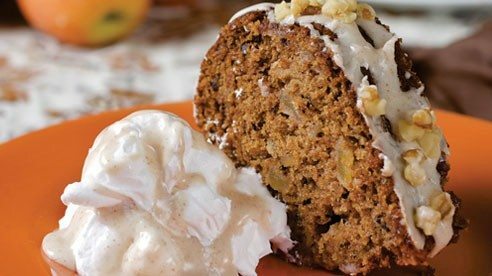 Combine all cake ingredients except walnuts. Beat 3 minutes at medium speed. Stir in nuts. Pour into a prepared pan. Bake 50 to 60 minutes until cake tester inserted in center comes out clean. Cool in pan 30 minutes. Invert onto serving plate. Cool completely. Combine all glaze ingredients except nuts. Blend until smooth. Spoon over cooled cake. Sprinkle with walnuts. May omit glaze and serve with vanilla ice cream.